Today I’ve got some photos of the Star Bijou house brand Spirit Beads‘ necklace and some gemstones. And before I forget, Star Bijou still has some of the Trollbeads Kimono Kits, like I showed in the blog post about the Dragons! Here is how the necklace arrived and this is exactly how I wore it for work. From top to bottom are the Lava Bead (€22), Faceted Citrine (€49), Faceted Carnelian (€33) and the dangle is also a Faceted Citrine (€89). The necklace starts at €39 for the 70cm and then you use the little adapter which comes in oval and circular shapes, for €15-19. This chain pictured here is the blackened version but it also comes in a shiny version. The Faceted Citrine in the middle is my favourite as it seems almost to glow and is such a soft, buttery yellow! 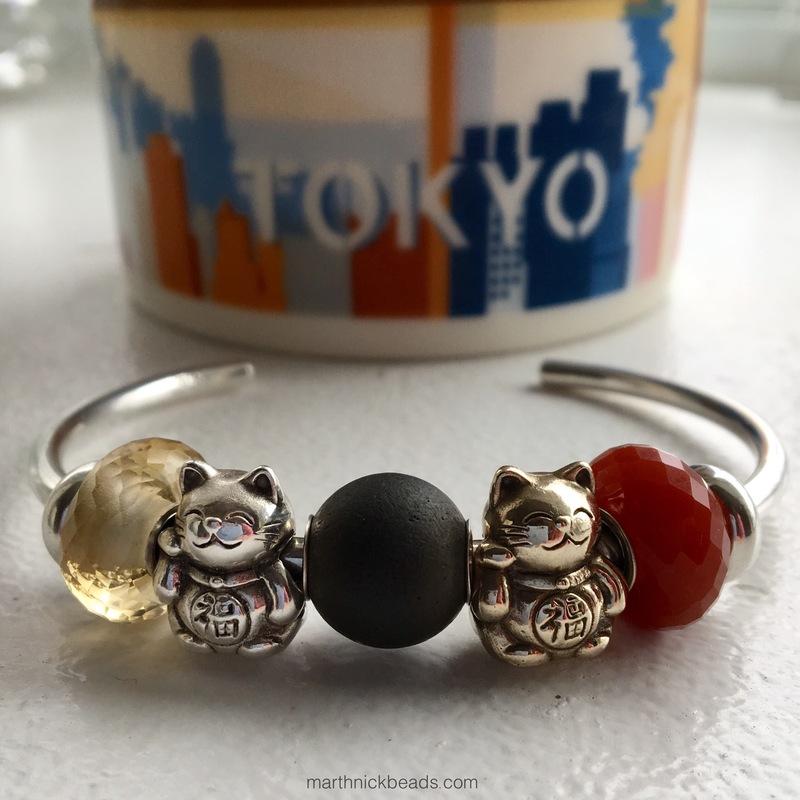 I used the three beads from the necklace for a Japanese inspired bangle, with the silver and brass Maneki-nekos. 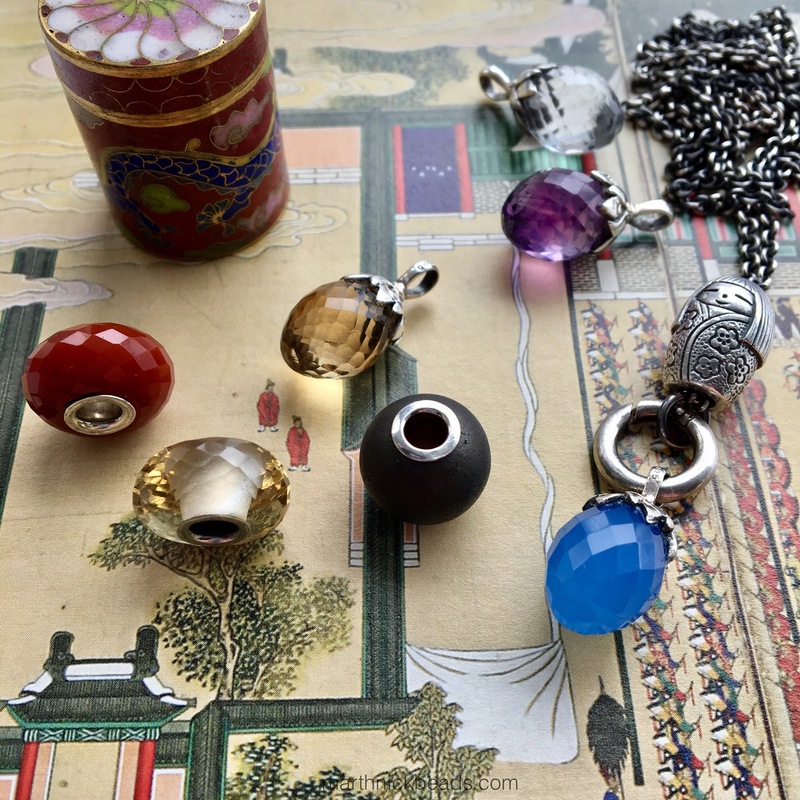 For this necklace below, I’ve used three glass Trollbeads and the sweet Kokeshi, also from Spirit Beads. The dangle is a Blue Chalcedony (€59). 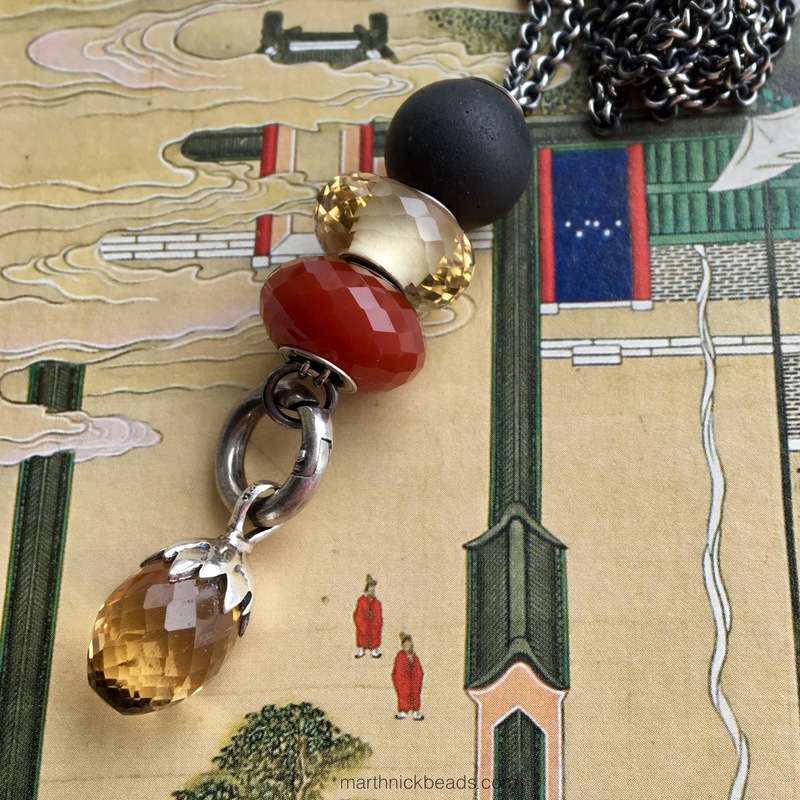 This necklace uses a Rock Crystal pendant (€59), some glass Trollbeads and then the fabulous Dragon and Chinese Lucky Coin from Spirit Beads. 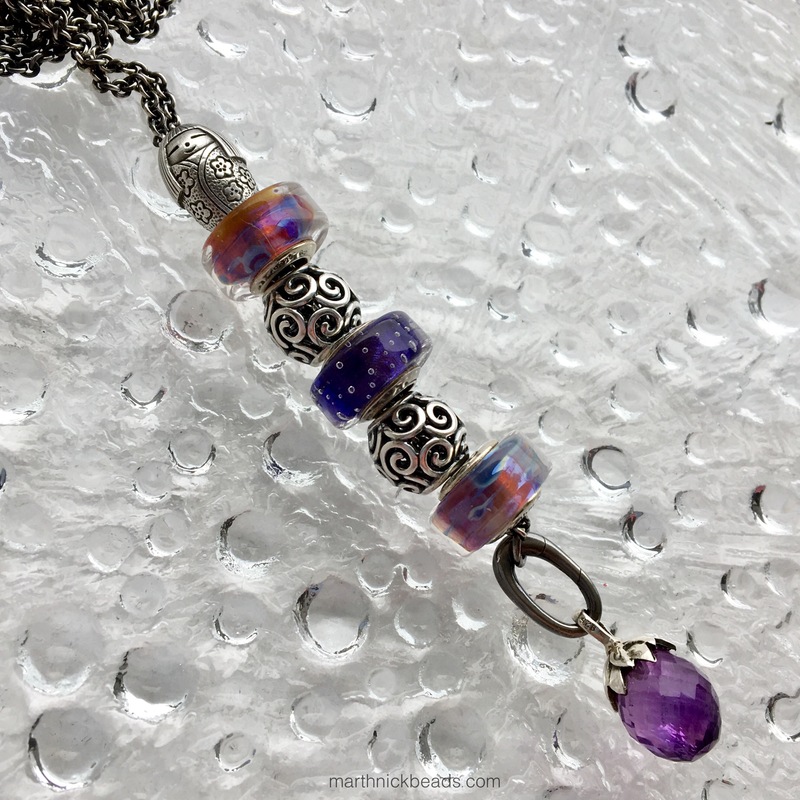 Lastly, I made up a necklace using some Purple Haze and Get in Shape Ohm Beads, a couple of silver Pandora beads, the Kokeshi from Spirit Beads and an Amethyst pendant (€89). 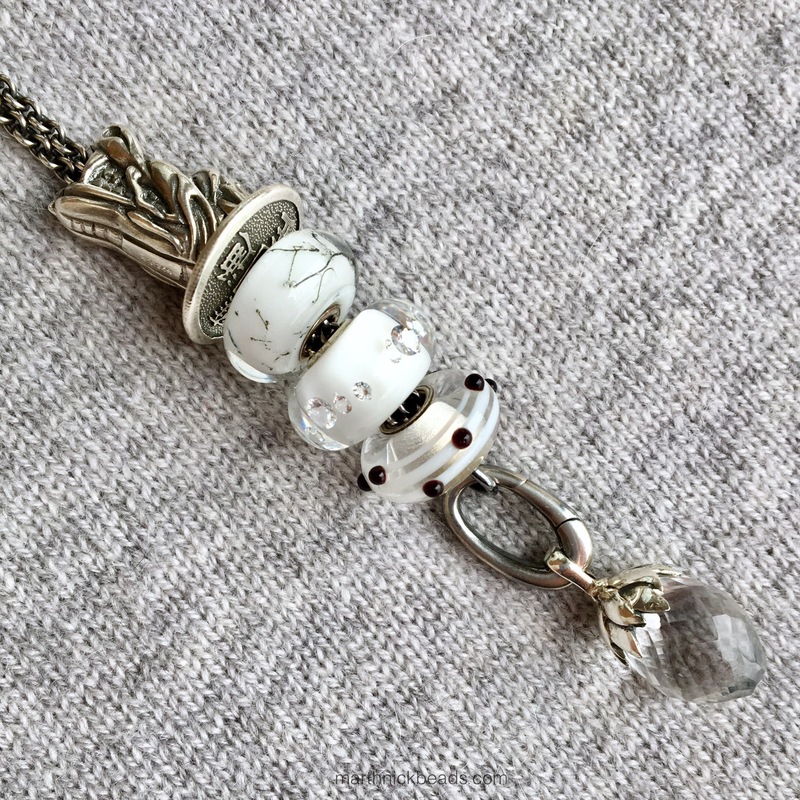 So, as an alternative to the Trollbeads Fantasy Necklace this is a fun, changeable system. I suppose you could even put a couple of dangles on the adapter clip, like one of these plus something with a narrow ring, like the Redbalifrog Palm Frond & Frog. Hope you’ve enjoyed this look at these beautiful beads! Coming up Friday are some new Fenton beads. I’ll be with limited wifi while on a short road trip but can try to answer any questions if anyone has any! The Spirit Bead system is very clever and the faceted gems are beautiful. I like the option to wear more than one dangle at a time on that nifty jump ring/ link. I think the wonderful chalcedony is my favourite, the colour is such that I have never seen before with that stone! The carnelian and citrine beads are also beautiful. All of the combinations you have created with them show just how lovely they are. Enjoy the rest of your trip, Martha. Thanks Sarah! We always have fun in the States. I think the Citrine and Blue Chalcedony are my favourite dangles. I’ll wear the blue one a lot as I have a blue sweater I’ll often wear for work. Did you see the new silver Sakura bead they’ve made? So pretty! Yes, it’s lovely! My sister named her cat Sakura, I should get tha tfer her. Get that for her! She only has an Essence and Pandora Bangle. Would it fit on Pandora? Hi Suzanne! Yes, they would make a lovely bracelet. 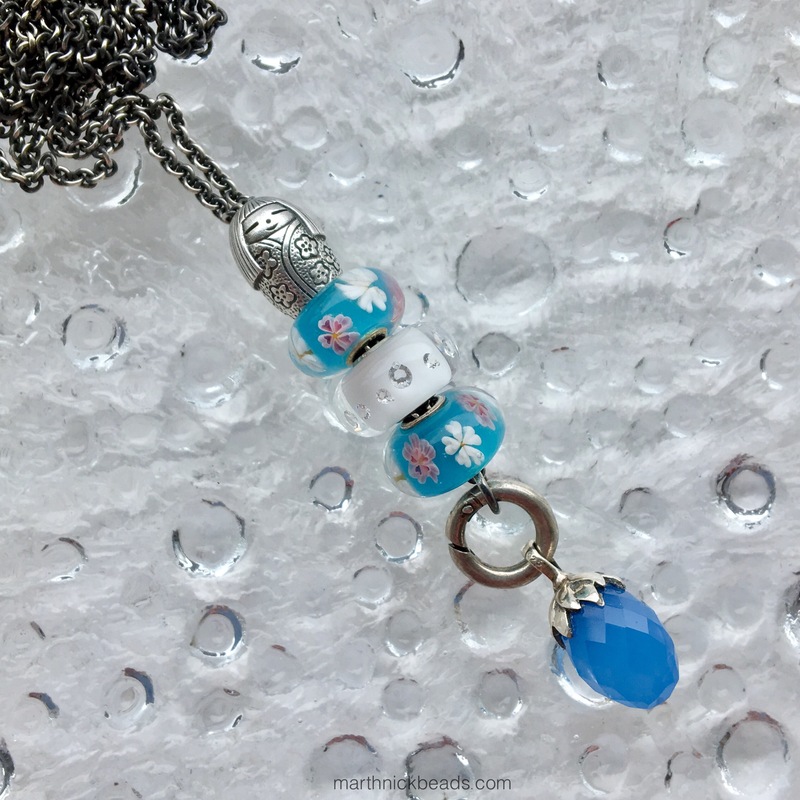 The glass Sakura bead can be hard to find as I think it was a limited edition. If I ever see any online for sale I’ll let you know! Oh that would be great, Martha. Thank you. It seems I’ve missed a few really good ones since I’m fairly new at collecting. But I’m trying to make up for lost time! Plus the search is part of the fun (unless I don’t find it!) Hope you’re having a good trip. I’m in N. J. and it’s snowing again. I need to look at your Spring designs!!! I hope you didn’t get too much snow with the storm, Suzanne. Yes, time for spring bracelets to keep us warm! Suzanne! Trollbeads Gallery just got in some of the Blooming Sakura Trollbeads! Hi Martha. I hope you’re having a wonderful time and good weather on your trip. We’re digging out from yesterday’s blizzard here in New England, but I’m hoping the snow won’t hang around too long. It is the middle of March after all. Thanks for showing the Spirit Beads necklace system. Your photos are wonderful. I’ve looked at the necklace online a couple of times but had a hard time envisioning how it worked. It’s really so clever! I especially like the citrine combination; the colors are gorgeous together. Thanks, Beth, I’m so glad the photos were of help. And I wore the necklace teaching grade two one day, which means lots of bending down and so on but it felt very comfortable and secure. Let’s hope the snow melts soon! Hi Martha! Your necklaces look really nice! I really like the purple one with the Amethyste. 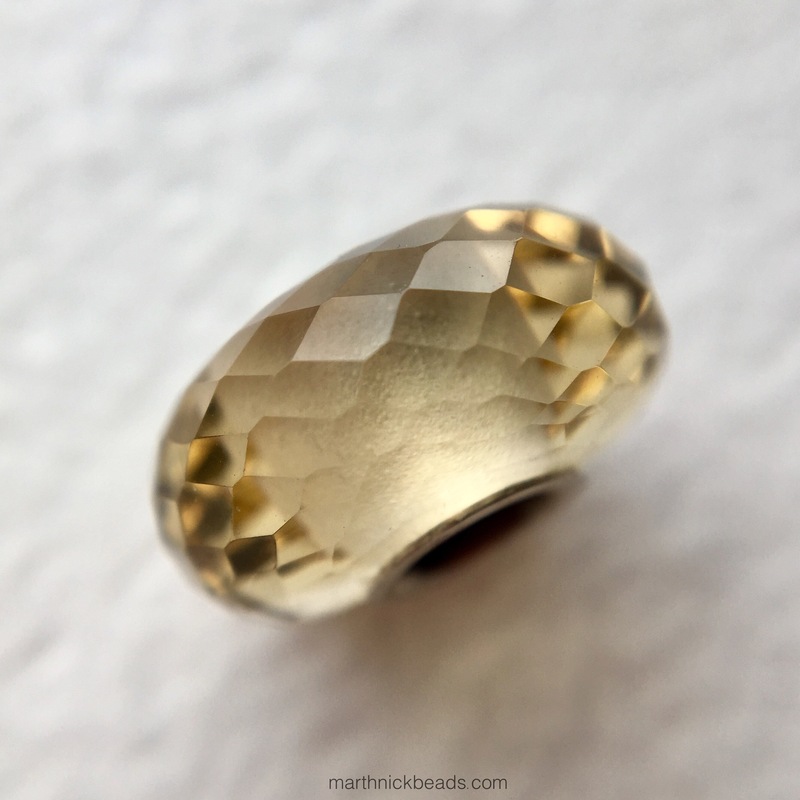 I was wondering if the faceted stones from Spirit Beads were the same size as Trollbead’s? Thanks Gabi for the answer. I’ll check the website regularly to try and get one then. Thanks Alexandra! And thanks Gabi for answering!